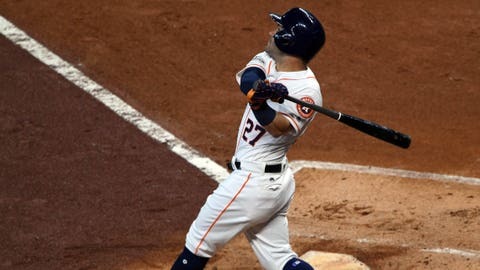 HOUSTON (AP) — Jose Altuve hit three home runs in an unprecedented show of power for the diminutive major league batting champion as the Houston Astros roughed up Chris Sale and the Boston Red Sox 8-2 Thursday in Game 1 of the AL Division Series. Despite his size, Altuve couldn’t be a bigger leader for the Astros. He’s one of the few players remaining who languished through a rebuilding process that led to three straight 100-loss seasons from 2011-13, and is perhaps the biggest reason this team ran away with the AL West title this year.